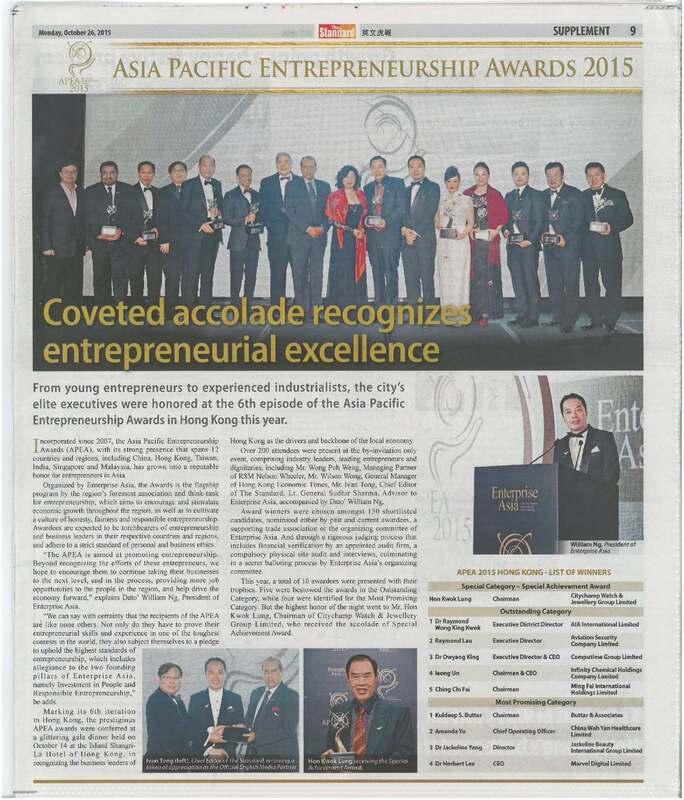 From young entrepreneurs to experienced industrialists, the city’s elite executives were honored at the 6th episode of the Asia Pacific Entrepreneuship Awards in Hong Kong this year. Incorporated since 2007, the Asia Pacific Entrepreneurship Awards, with its strong presence that spans 12 countries and regions, including China, Hong Kong, Taiwan, India, Singapore and Maylaysia, has grown into a reputable honour for entrepreneurs in Asia. Organized by Enterprise Asia, the awards is the flagship program by the region’s foremost association and think-tank for entrepreneurship, which aims to encourage and stimulate economic growth throughout out the region, as well as to cultivate a culture of honesty, fairness and responsible entrepreneurship. Awardees are expected to be torchbearers of entrepreneurship and business leaders in their respective countries and regions, and adhere to a strict standard of personal and business ethics. “The APEA is aimed at promoting entrepreneurship. Beyond recognizing the efforts of these entrepreneurs, we hope to encourage them to continue taking their businesses to the next level, and in the process, providing more job opportunities to the people in the region, and help drive the economy forward,” explains Dato’s William Ng, President of Enterprise of Asia. “We can say with certainty that the recipients of the APEA are like none others. Not only do they have to provide their entrepreneurial skills and experiences in one of the toughest contests in the world, they also subject themselves to a pledge to uphold the highest standards of entrepreneurship, which includes allegiance of the two founding pillars of Enterprise Asia, namely Investment in People and Responsible Entrepreneurship,” he adds. Marking its 6th interation in Hong Kong, the presidents APEA awards were conferred at the glittering gala and dinner held on October 14 at the ISLAND Shangri-La Hotel of Hong Kong, in reconizing the business leaders of Hong Kong as the drivers and backbone of the local economy. Over 200 attendees were present at the by-invitation only event, comprising industry leaders, leading entrepreneurs and dignitaries, including Mr. Wong Poh Weng, Managing Partner of RSM Nelson Wheeler, Mr. Wilson Wong, General Manager of Hong KONG Economic Times, Mr. Ivan Tong, Chief Editor of the Standard, Lt. General Sudhir Sharma, Advisor to Enterprise Asia, accompanied by Dato’s William Ng. Award Winners were chosen amongst 150 shortlisted candidates, nominated either by past and current awardees, a supporting trade association or the orgaizinig committee of Enterprise Asia. And through a rigorous judging process that includes financial verification by an appointed audit firm, a compulsory physical site audit and interviews, culminating in a secret balloting process by Enterprise Asia’s organizing committee. This year, a total of 10 awardees were presented with their trophies. Five were bestowed the awards in the Outstanding Category, while four were identified for the Most Promising Category. But the highest honor of the night went to Mr. Hon Kwok Lung, who received the accolade of Special Achievement Award.